Financial incentives—from rebates to lower interest rates—can help residential energy efficiency programs attract customers’ attention. Deadlines can create a sense of urgency and motivate homeowners to action on home energy upgrades. Many programs successfully established time limits on financial incentives and saw participation dramatically increase. Programs often discover that offering limited-time incentives can bring about a welcome surge in assessment and upgrade work for contractors, especially during slow seasons. Some programs, however, found that they were not sufficiently prepared for the spike in interest and lost customers because they could not respond to them quickly enough. Other programs added temporary staff for call centers when a limited time offer was launched, created a temporary pool of home performance technicians to help contractors with increased workloads, or scheduled incentives to coincide with seasonal downtimes for contractors. Following are a few approaches that programs across the country have taken to increase residential demand for energy efficiency using limited-time offers. 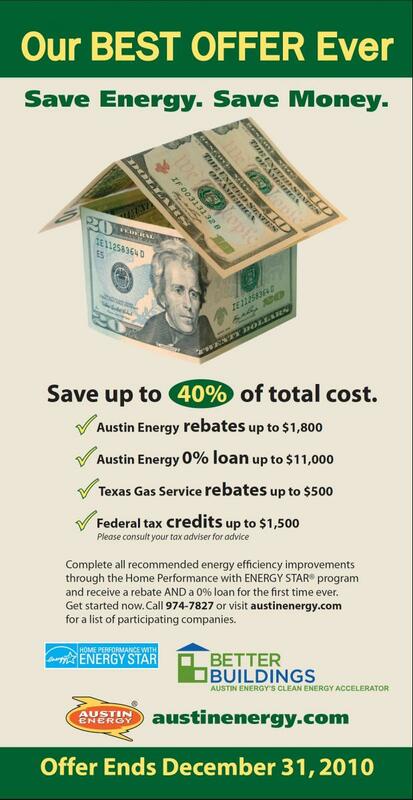 To generate momentum for its Clean Energy Accelerator program, Austin Energy launched a three-month Best Offer Ever campaign from October through December 2010. The offer combined a 0% interest rate loan with rebates from local utilities to reduce energy upgrade costs by an additional $1,200 per household beyond its typical offer. Demand soared during the three-month time limit for the offer. To account for increased demand, Austin Energy also collaborated with contractors to launch the promotion during their slow seasons—typically the fall and winter—so the upgrades could be completed in a timely manner and contractors could avoid seasonal layoffs. The Best Offer Ever resulted in a record 568 upgrades completed within the program’s first six months, which was more than 10 times the utility’s typical participation rate for a similar timeframe. Enhabit, formerly Clean Energy Works Oregon, found that offering limited-time, bonus rebates on top of its generous base rebate of $2,000 ($500 for an assessment and $1,500 for upgrades) attracted new customers and increased conversion rates. During the first limited-time offer, the organization attracted a surge of new customers with additional $1,700 rebates. For a second limited-time offer, the program decreased the bonus rebate to $500, and still saw an increase in participation. Enhabit also coordinated with contractors on these offers, giving them a reason and opportunity to increase their marketing efforts and take advantage of the momentum created. Efficiency Maine offered customers a rebate for 30% of project costs, up to $1,500 for comprehensive projects that were estimated to achieve at least 25% energy savings. The rebate amount increased to $3,000 for deeper upgrades designed to achieve at least 50% savings. After early response rates were low from both contractors and homeowners, Efficiency Maine offered an additional, limited-time $1,000 summer bonus incentive from June through September 2010 at both the 25% and 50% savings threshold. Efficiency Maine found that the limited-time offer was key to motivating homeowners to participate in the program, but even when incentives were reduced back to the original levels, contractors still kept the volume of customers above pre-bonus levels. 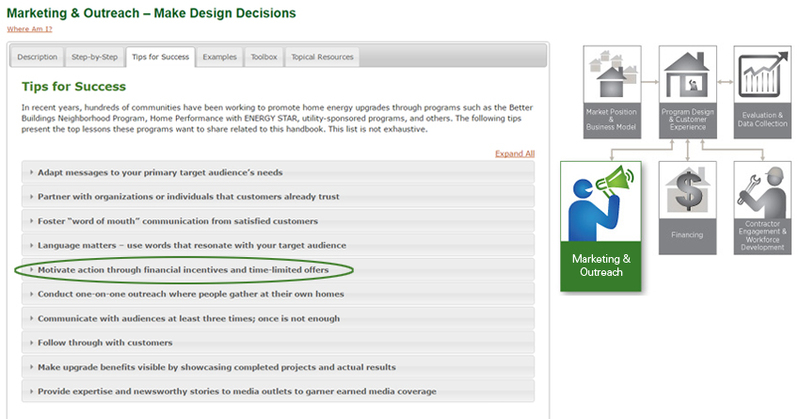 Discover more lessons learned on how to increase demand for home energy upgrades with limited-time offers and other incentives by visiting the Better Buildings Residential Program Solution Center Marketing & Outreach – Make Design Decisions handbook for step-by-step guidance and program examples. Haven’t used the Residential Solution Center before? Get started here!